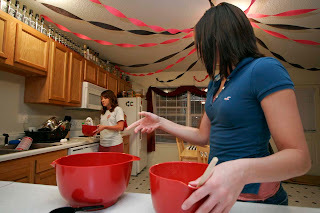 Lindsey Griffith asks her roommate Alison Brown how much cinnamon she should add to the mixture as Brown beats the batter. Griffith and Brown were baking cookies to bring home for the mothers on spring break. Debbie Newby files camping reservations for the coming spring and summer for the park's campsite. Newby is the Park Superintendent at Finger Lakes State Park just north of Columbia and is in charge of the campsite as well as managing the park. 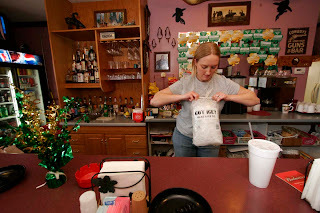 Jackie Olek opens a bag of ice to be dumped into the cooler behind the counter at Lucy's Cafe in McBaine. Olek mutitasks as a server, cook and hostess during the afternoon and is always kept busy at the small watering hole outside of Columbia. 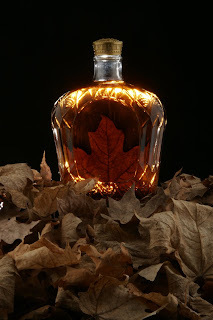 A bottle of Canadian whiskey stands among a pile of one of Canada's national symbols - the sugar maple leaf.